When I saw this recent video (or link here) of a strange object near the Lagarflot, Iceland, the word "skrimsl" came back to my mind after many years. The Skrimsl is the reputed inhabitant of that lake and others in Iceland with a reputation going back to Norse times. The werewolf expert, Sabine Baring Gould, even got involved in them when he visited Iceland in 1860. He obtained a description of an odd 46 foot beast which one of the witnesses drew (below). I enjoyed reading about it back in the 1970s as a kid when Peter Costello recounted the tale in his book "In Search of Lake Monsters". What this video shows is intriguing but I am sure multi-interpretations will be suggested across the Internet in the weeks ahead. It was taken by a Hjort Kjerúlf but some suggest already it is debris which has frozen solid on the river. Skeptical believe, however, netadræsa was blown into the water and frozen solid. So when the river began to forge their hlykkjaðist "worm" on the river. Any Icelanders reading this who can translate? UPDATE - I think netadræsa refers to a fishing net. Also, the owner of the film is not claiming it is anything - but certainly no hoax on his part. It is also amazing how the world media has picked up on this but has also called it something like "The Loch Ness Monster in Iceland". It is always curious but understandable how anything mysterious in a lake is labelled "The Loch Ness Monster in ..." but then again those four words are a global and instantly recognisable brand name (under no one's trademark!). I am currently working on a larger article, but this came in and had "must blog" written all over it. It is a picture taken of something on Loch Ness, perhaps north of Invermoriston. Is it a hoax? Is it a log or some ducks swimming past? Perhaps it is some otters playing in a line while the leader performs a dive in a neck like manner? Is it in fact a photo of Nessie? One clue, it is not a hoax. 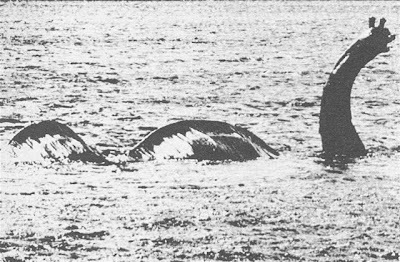 So after various suggestions have been offered, it turns out, it is not the Loch Ness Monster but neither is it a hoax. It is the model monster made for the film "The Private Life of Sherlock Holmes" released in 1970. I thank Paul Cropper who runs a website on the Yowie for spotting this clipping from that well known cryptozoological journal, The Australian Women's Weekly of the 25th August 1971. A Jean Constable included this shot in her write-up about a trip to Scotland with her husband. They had just left Invermoriston when she spotted "Nessie" and urged her incredulous husband to double back. Astonished, he began snapping pictures but then they eventually saw the boat pulling the beast and the game was up. Nevertheless, it's a great picture for the Loch Ness Story archives. Below are two close up pictures of this wonderful prop but it is also very interesting to see it in "Nessie Sighting" mode. The photograph at the bottom of this blog shows Holmes and Watson encountering the "monster" as the film reaches its climax. However, the "beast" in our photograph is not the "beast" in the film for it sank without trace in Loch Ness and lies somewhere at the bottom of the loch to this day (well I suspect after forty years it is now a very ragged wireframe). Two accounts here sum up the loss of the prop. The production was a troubled one, full of technical snafus like having to reshoot the entire Loch Ness sequence (the real location was too difficult to properly light among other problems). Leading lady Genevieve Page recalled in Charlotte Chandler's biography, Nobody's Perfect: Billy Wilder, "When we lost our Loch Ness monster, he wasn't too concerned, even though he was also the producer. He was more concerned about how the man who made it felt when all his work sank to the bottom of the Loch Ness. He went over and comforted him." She was referring to special effects man Wally Veevers's elaborate "monster," which worked beautifully until they gave it a test run in the Loch Ness. After its failure, Wilder decided to shoot it in miniature in the studio." 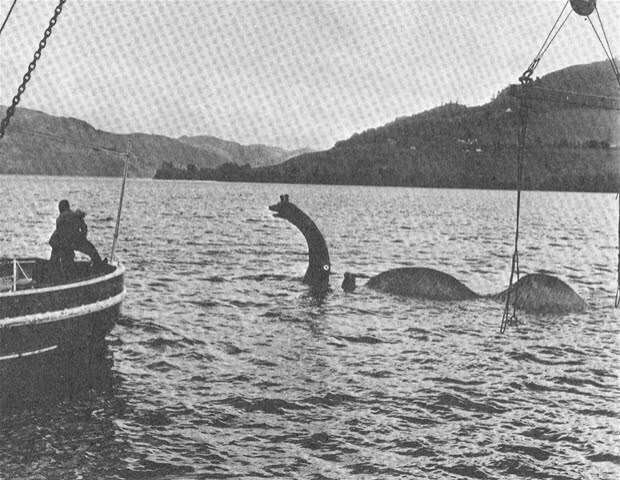 Originally, the scenes featuring the Loch Ness Monster were intended to be filmed in the actual Loch. A life-size prop was built which had several Nessie-like humps used to disguise floatation devices. The humps were removed, however, at Billy Wilder's request. Unfortunately, during a test run in Loch Ness, the Monster-prop sank and was never recovered. A second prop (just the head and neck) was built, but was only filmed inside a studio tank. So the prop in the film was a head and neck only. What this photograph shows is the full monty head, neck and two humps being towed in a test run. In fact, it could be surmised that Wilder's instruction to remove the humps which aided buoyancy precipitated the loss. No doubt there are one or two tales yet to be told about this resident of Loch Ness. What I would have found very interesting is the question of what would have happened if this picture had been given more publicity. Would the sceptics of the time have merely offered the usual deer, bird, otter, logs explanations with no real critical thinking? Clearly, they would have been as wrong as the believers who may have seen this as prime evidence!